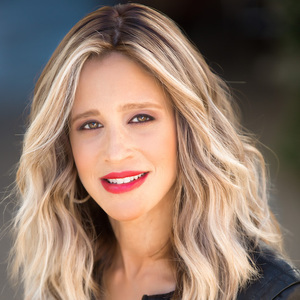 A vibrant member of Southern California's real estate industry, Basya is well known for her positive approach to tackling every prospective deal, from the quaint starter-homes & investment properties to the elegant sprawling estates of Los Angeles. Her core focus includes the Hancock Park & Westside neighborhoods. With an approachable personality, Basya is a proud agent of Compass who makes herself available to her clients as if they were family. "My perspective on homeownership in today's real estate market is to bring out my clients' driving forces behind their home purchase," Basya says, "and ensure that all those needs & plans are recognized & incorporated into their home buying experience". 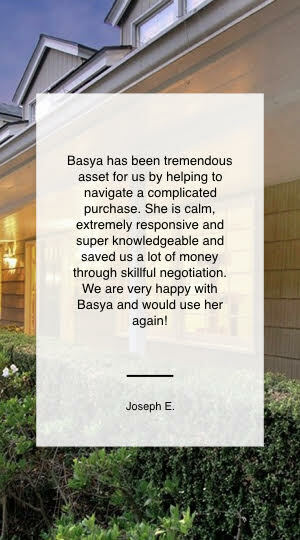 Whether representing young couples, a growing family, or even retirees, Basya is no stranger to the art of effective negotiation. Her gift for design coupled with her passion for homes is evident in her ability to get her clients not only the best deal, but a property they can immediately be proud of. Her tireless effort to make your purchase or sale of a home a smooth and seamless experience truly shines as Basya navigates the real estate market for you. When she's not dabbling in real estate, Basya dedicates her time to her husband & children, as well as to the many guests she hosts with finesse. With the proper market-based guidance and unwavering support Basya provides, her expertise is unparalleled. Investing in your piece of the American dream & becoming a homeowner boils down to the professional representation you implore to get the job done. Basya is your agent; period. 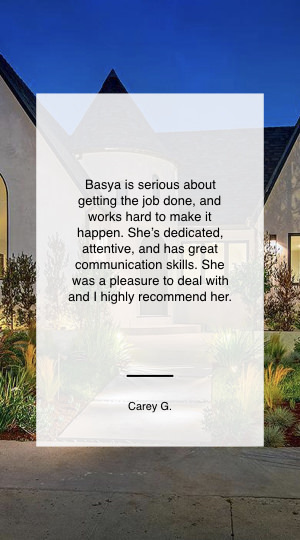 Proactive, determined and always willing to go the extra mile, Basya won't stop until she finds you the perfect home or homebuyer. Even when Basya is on the go, she'll stop and take time to respond to client texts, emails and phone calls-and always with a smile. From the moment you meet Basya you'll see why her clients call her their friend. She's warm, approachable and takes time to get to know you. Stately Italian Villa situated on a private resort-like property, this 4 BD 7 BA Estate is custom designed to perfection! Hidden street-side w/ ultimate privacy as you enter the ground level, featuring a grandiose master suite, striking walk-in closets, majestic tiled baths w/ heated floors & private balconies overlooking the canyon view. The 2nd bedroom is perfect for an office/exercise room continuing down a rich-wood staircase you are enveloped by the sunlit 2nd level that encompasses a spacious living room w/ exquisite built-ins, surround sound, marble fireplace & ceiling entertainment system. The elegant dining room is followed by a gourmet kitchen featuring all the amenities a chef desires. French doors throughout open to multiple balconies w/ stunning views for indoor-outdoor entertaining. The bottom level features 2 additional bedrooms w/ ensuite baths, a den which lead to a breathtaking oasis w/ pool & spa. Leave the hustle of the city behind as you enjoy this paradise! Impeccably maintained front-facing 4 bedroom, 3.5 bath, 2350 sq ft single-story condo in prime West Hollywood. Perfect location just moments away from famed restaurants and shopping on Melrose Ave and just a short distance to The Grove. Hardwood flooring throughout, a laundry room, spacious floor plan and generous sized bedrooms round out just a few of the amazing features of this condo. Included with the unit are two assigned parking spots and a large designated storage room. TRULY ONE OF A KIND!